Say the word Marigold and the bright summer flowers of annual borders and beds are brought to the mind's eye. Few would include Marigold in their list of favorite fragrances. Images of Marigold rarely include dinner or dessert. Yet, there are members of this genus which do offer flavor and aroma for our enjoyment. 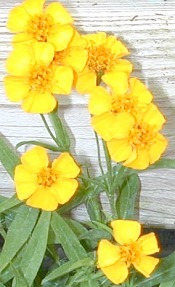 Perhaps the most well known of the 'abnormal' Marigolds is Tagetes lucida or Spanish Tarragon. Spanish Tarragon is sumptuous with meats, vegetables and its slight anise sweetness makes it perfect for rice, pasta and desert dishes. Much easier to grow and more bountiful, it is the perfect replacement for French Tarragon and can be used in the traditional blends "Fines Herbes", "Herbes de Provence", and " Bouquet Garni". It can be used alone or in conjunction with other herbs like Basil to flavor White Wine Vinegar. Add a couple of teaspoons of Tarragon Vinegar to Hollandaise Sauce for a special Eggs Benedict Brunch. Particularly tasty with scallops, chopped Tarragon added during steaming or barbecuing can improve almost any white fish. Snip leaves anytime during the growing season for fresh use. Harvest for winter before the first frost. Preserve by blending with a little olive oil and freezing. Deliciously blessed with the sweetness of licorice, this dark green, herbaceous perennial is easy to grow. It flowers only where winter comes very late. And, unlike the leaves, the flowers are of no real value. They are small, single, gold daisy-shaped flowers that taste like grass. Growing to 3 or 4 feet, Tagetes lucida is handsome in the garden and may be cut for use all summer and fall. Even if left untrimmed, the leaves remain usable and fresh throughout the growing season. Hardy to at least 5 degrees, and very easy to grow, it is often suggested as a garden substitute for French Tarragon (Artemisia dracunculus sativa). Hence two of the common names often associated with Tagetes lucida---Winter Tarragon and Spanish Tarragon. In colder areas, plants can be grown in a container outside during the spring and summer and then be over-wintered indoors. Growth may disappear below the ground, but should return in the spring. Grow in full sun for maximum flavor development. In the garden, Spanish Tarragon likes loose soil with good drainage. 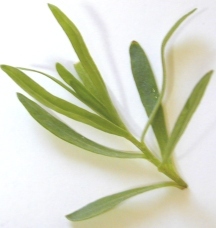 Recently we compared Spanish Tarragon with its counterpart French Tarragon. We discovered the 'dragon' (dracunculus translated) associated with French Tarragon was missing completely from our Marigold. The first part of our comparison was easy and basic. We ate fresh leaves of both plants from the garden. What we discovered by doing this held true for the remaining paces we put these two herbs through. 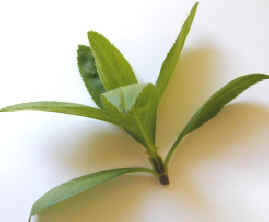 Finding #1: French Tarragon numbs the tip of the tongue while Spanish Tarragon stimulates the sweet taste buds. We added both herbs fresh to rice and boiled. Spanish Tarragon gave the rice a pleasant slightly anise flavor. French Tarragon was too strong for the subtly flavored rice and left us asking for salt. Try 2 Tablespoons freshly chopped Spanish Tarragon with one-half cup brown rice. Finding #2: Since the acquisition of the bread machine, all herbs tested for flavor usually find their way into bread. We used a Basic white French bread with no added sugar. As a member of the herb blend, Fines Herbes, French Tarragon has traditionally been added at the end of cooking so that the flavor will not cook away. This just did not prove to be true. As with the rice, we learned that French Tarragon holds up well to prolonged cooking. But, unless you like pepper in your bread leave out the French Tarragon. And, since the Spanish Tarragon lost almost all of its flavor, we discovered here are two herbs better suited to foods other than bread. Finding #3: We already knew French Tarragon was great with our vinegar based potato salad. So this next challenge was for Spanish Tarragon. Finding #4: The bland flavor of potatoes is enhanced greatly by the addition of Tarragon. French Tarragon gives this potato salad a spicy kick, and Spanish Tarragon contributed more of a fruity taste. Both are good, but different. Try both! The amount of Spanish Tarragon should be increased to 3 Tablespoons. The last test was a little different. We made brownies! Finding #5: Spanish Tarragon adds a special taste to chocolate that is subtle yet very right. Try 3 Tablespoons freshly chopped Spanish Tarragon to a recipe using 4 ounces of unsweetened chocolate. French Tarragon was lost to the overpowering chocolate and yet the brownies had an odd off taste. Again, we learned that French Tarragon is easily overpowered. While Spanish Tarragon may not be as spicy as French Tarragon, it can be used in most recipes calling for Tarragon with more than satisfactory results. It is definitely easier to grow and provides much more per plant to work with. Other unusual Marigolds are the fragrant, culinary perennial Tagetes nelsonii, referred to as the Citrus Scented Marigold, and the beautiful ornamental perennial Tagetes lemonii. Learn more about these Tagetes and other unusual herbs. Spanish Tarragon makes a great addition to our Kitchen Herb Garden Six Pack.